Who knew a Michigan birth certificate was something to crow about? Sure, Michigan is a great place to visit, but according to Mitt Romney it’s so much more. It’s great place to be born, entitling each lucky recipient a gen-u-ine US birth certificate, that will come in mighty handy if your citizenship’s authenticity should ever come into question. Who could forget Mitt Romney stumping in Michigan for the Presidential primary, digging his home-grown heels deeply into his roots as he rhapsodized about the state he left behind. 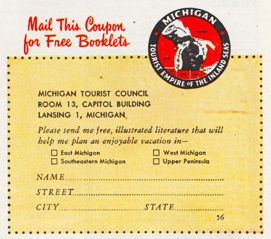 If Mr Romney doesn’t make it as President, surely there’s a job waiting for him at the Michigan Tourist Council. 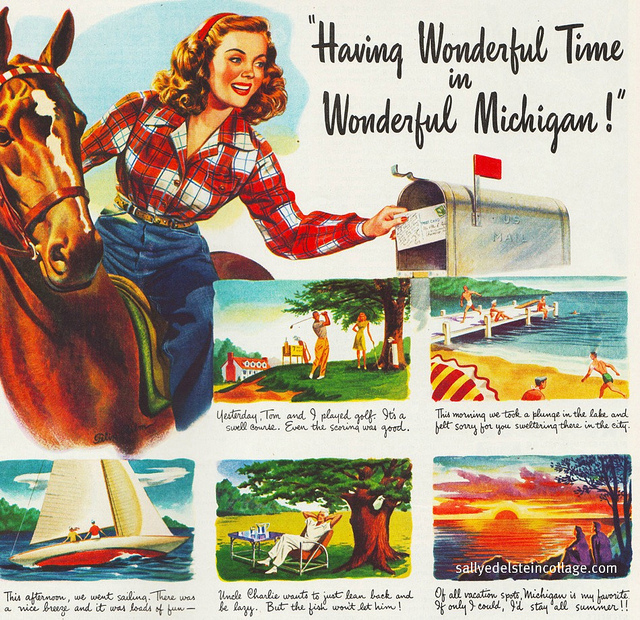 His glowing speech sounded like something straight out of the copy in the featured 1946 ad featured for Michigan tourism. Or pander for their vote.